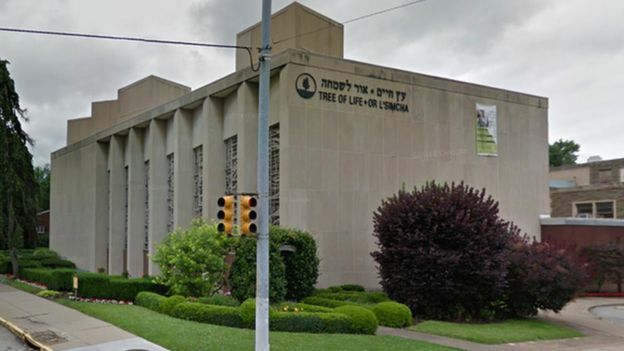 A gunman entered the Tree of Life synagogue in Pittsburgh on Saturday morning and opened fire, killing 11 people. Six people were injured, among them four police officers, in the attack on the synagogue in the Squirrel Hill district. The suspect, who was taken into custody, has been named as Robert Bowers, 46. Here’s what we know so far about the shooting. Warning: This story contains offensive language and anti-Semitic quotes. The gunman entered the building shortly before 10:00 local time (14:00 GMT) on Saturday, during a service. He was armed with three Glock 57 handguns and an AR-15 assault rifle. He was leaving the building when he was met by emergency responders. Two officers – among the first to arrive – were injured in an initial confrontation with the gunman. A further two Swat team members were hurt inside the building, clashing with the shooter. The gunman suffered multiple gunshot wounds and surrendered to the authorities. 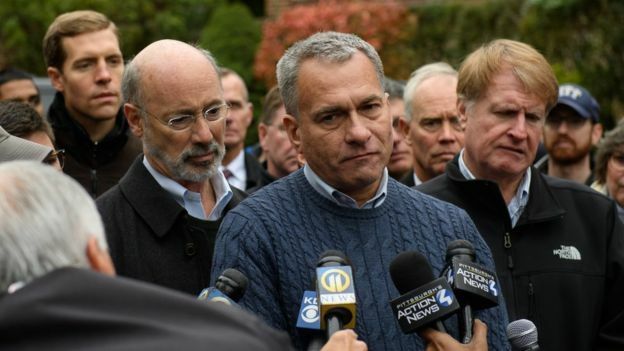 The crime scene was “horrific”, Pittsburgh’s Public Safety Director Wendell Hissrich told reporters. “One of the worst I’ve seen, and I’ve [worked] on some plane crashes. It’s very bad,” he added. They were named on Sunday as Joyce Fienberg, 75; Richard Gottfried, 65; Rose Mallinger, 97; Jerry Rabinowitz, 66; Cecil Rosenthal, 59; his brother David, 54; Bernice Simon, 84; her husband Sylvan, 86; Daniel Stein, 71; Melvin Wax, 88, and Irving Younger, 69. A 61-year-old woman and a 70-year-old man are also currently being treated for injuries. The man had gunshot wounds to the torso and is in a critical condition. Daniel Stein’s nephew, Steven Halle, described him as “somebody that everybody liked” and a “kind soul”. He said his uncle had recently become a grandfather and attended the synagogue every Saturday for services. One injured officer was released from hospital on Saturday, another was to be released on Sunday with the other two needing more treatment. What do we know about the synagogue? The Tree of Life was set up more than 150 years ago, its website says. It merged with nearby Or L’Simcha congregation about five years ago, to form the Tree of Life – Or L’Simcha Congregation. The synagogue is in Pittsburgh’s east-end Squirrel Hill area, which has a large Jewish community dating back to the 1920s. The Jewish Federation of Greater Pittsburgh’s President Jeff Finkelstein told reporters up to 50 or 60 people regularly worshipped there on a Saturday morning. According to the calendar on its website, Shabbat morning services were scheduled between 09:45 and 12:00. Extra police officers were deployed at synagogues and Jewish centres across the US after the attack. 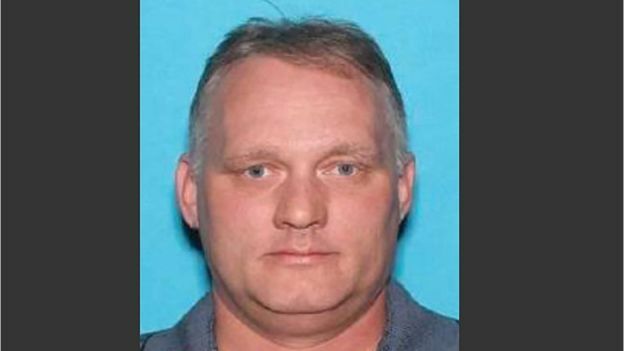 The suspect has been named as Robert Bowers. He is in fair condition in hospital. FBI special agent Robert Jones said that Mr Bowers did not appear to be known to authorities prior to events on Saturday. Mr Bowers has posted anti-Semitic content on social network Gab under the username “onedingo”. The bio on his account – now suspended – read: “Jews are the children of Satan”. On Saturday morning, he criticised refugee aid group Hebrew Immigrant Aid Society (HIAS) and said he could not “sit by and watch my people get slaughtered”. “Screw your optics, I’m going in,” he wrote. In earlier posts, he attacked US President Donald Trump and his “Make America Great Again” (Maga) slogan, as well as the Jewish community. “Trump is a globalist, not a nationalist,” he wrote. He also expressed support for the QAnon conspiracy – an unsubstantiated, far-right fringe theory based on the belief that Mr Trump is organising a secret plan to investigate and arrest famous or politically elite child abusers. It was a busy day at Beth Tzedec Congregation. But as Hebrew school let out, and an afternoon conference kicked off, hearts were heavy with sadness and anger. Lorraine Sandler has been a member here for more than 40 years. She was shocked when she learned about the shooting in Pittsburgh. 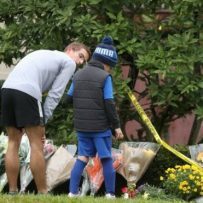 The shooting in Pittsburgh is troubling for Jewish communities around the world, with some seeing the recent violence as an attack on the entire Jewish people. Dealing with anti-Semitism is a fight many tackle on a regular basis. Steven Shulman is the senior Vice President with the UJA Federation of Greater Toronto. “Here in Toronto if you look at the latest police statistics, the Jewish community is the most targeted by hate crime and that’s been the case for many years,” Shulman said. In the last few months, police across the GTA have responded to a number of incidents, but the recent shooting south of the border raises fresh concerns. In response, Toronto Police Chief Mark Saunders tweeted that the force condemns the recent violence and stands with the Jewish community. Other officers, meanwhile, also addressed police efforts. “I want to reassure [the community] that we are doing everything we can to monitor any potential risks to public safety here,” Cst. David Hopkinson told Global News on Sunday. At Beth Tzedec Congregation, having security in place is common. Staff are on site inside the doors, searching people’s bags as they enter the building. Thinking about safety, Shulman says, is not new for the Jewish community. “Congregations always have some sort of security budget as do community centres,” Shulman explained. At certain times of the year it is an automatic that we would bring in paid duty police officers.” Still, against this latest backdrop of hate and worry, members of the community say they have resolved not to live in fear. “It shouldn’t stop us from being who we are and from being proud to be Jewish, and to be part of this larger global community,” Aiden Orzech, a teacher, told Global News. It’s a message he says he hopes to share with his students.